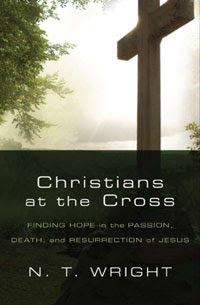 I just finished reading Christians at the Cross by N.T. Wright. What an incredible book! This book is a pilgrimage through Holy Week--a pilgrimage from grief and despair to celebration and resurrection hope. Wright invites the reader to allow all their stories of grief and sorrow to be consumed by God's story of grief and sorrow, to be met by God in the lowest places. And a funny thing happens when we are met by God in the darkest places; we've nothing left to fear. If God meets us in the place so low that you can't go any lower, where we must "wait without hope for hope would be hope for the wrong thing" (page 66), then there's nowhere to go but up. This actually can make us very dangerous people (in a good way) because no matter how bad the cross can be, resurrection is on the other side. Wright writes, "I am convinced that when we bring our griefs and sorrows within the story of God's own grief and sorrow, and allow them to be held there, God is able to bring healing to us ans new possibilities to our lives. That is, of course, what Good Friday and Easter are all about" (from the introduction). Wright rightly suggests that when we go through the process of actually "owning up to the grief which we often hide," without pretending that it isn't there or simply bottling it up, allowing it to play it's melody alongside Christ's passion, we can find creative new possibilities, even new creation, on the other side. This is a powerful collection of reflections, one for each day of Holy Week, which gives new life to the story of redemption and to the meaning of each day of Holy Week. I would recommend this as a great devotional for Holy Week this year or for any week of the year for that matter.